Our Correction Bit is an extraordinary product that will provide maximum comfort for your horse. 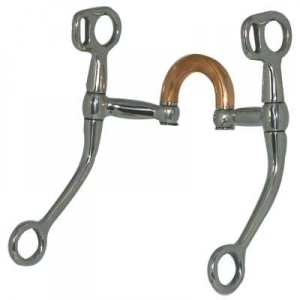 As shown in the picture above, This Training Bit is a high-quality horse tack item. They have been designed to be one of the most durable horse products available worldwide. This Correction Training Bit with Copper Port is a top quality item. It comes with a solid copper port which is very durable and also helps with the horses salivation. Measures 5'' in size.